In the months before Graduate Fashion Week 2018, designers were spending their days and evenings working in their university studios, preparing for the catwalk and creating pieces that represent their ideas and passions. Before GFW18 begun, we collaborated with many brands to offer competitions, with various opportunities as prizes. One of these competitions was the Lenzing Sustainable Denim Competition. Students were encouraged to create a moodboard that determined graphic direction, fabrics and inspiration of a denim product, and a short description of the denim designs they were imagining. Ten selected entrants were invited to participate in a day of workshops from experts in the field, from dying processes to the realities of a production methodology that supports Tencel's sustainable ethos. Tencel, Lenzing's flagship textile brand, would provide fabrics, workshops and a wealth of technical textile knowledge to the ten shortlisted designers in order for them to turn their piece into a reality. Here, we shine a light on the artistic and ethical designs that those ten talented designers created! Watch this space as we catch up with Niam Carr, and see her winning jacket on the catwalk during the Considered Design Showcase at GFW18. "The collection that the denim jacket sits within is inspired entirely by personal experience and imagery from travelling and vintage garment research. Inspired by a photo taken on an U-Bahn platform in 2017. The washed pink walls and two doorways inspired the colours and shape of the front pockets of the jacket." "This collection seeks to create a contrived narrative of prints, contruction and zero waste fabrics. My concept is based on a documentary called Dogtown Redemption. In order to create a mutually sustainable relationship with the Earth, we collaborate with nature"
"Sustainable upcycling is the concept of this project, repurposing something old and creating something new and combining those with sustainable Lenzingfabrics. The idea with this concept is to introduce responsible and sustainable practice to consumers, shifting their mind sets onto a more sustainable and eco-friendly perspective. " "The title of the collection originates from a pair of Sheffield Steel fabric sheers my father gifted to me, inscribed ‘For the Fabric of Life’. Garment inspiration was drawn from a flying suit, repurposed by my father, who wore it for DIY. The pattern pieces for this were reconstructed in a multitude of ways, emulating the steel sculptural work of Nick Moran"
"IN TODAY'S SOCIETY, AS INDIVIDUAL HUMAN BEINGS WE ARE CONSTANTLY BEING FOLLOWED BY CAMERAS BEING WATCHED BY CCTV, AND OUR LIVES ARE PUBLICLY DISPLAYED VIA SOCIAL MEDIA. AS A SPECIES WE HAVE NO PRIVACY IN TODAY'S WORLD, WHICH CAN MAKE US FEEL TRAPPED, A PRISONER IN OUR OWN MIND. MENTAL HEALTH IS A HUGE ISSUE WITHIN OUR SOCIETY AND IT CAN AFFECT EACH AND EVERY ONE OF US IN DIFFERENT WAYS. THIS IDEA OF IMPRISONMENT LED ME TO LOOK AT THE DENIM WORN AS PRISON UNIFORMS IN THE US AND STRAIT JACKETS USED IN MENTAL ASYLUMS OF PAST DECADES. MANY PRISONERS, AS WELL AS SUFFERERS OF MENTAL HEALTH ISSUES"
"ALEX MULLINS REPURPOSED - A SUSTAINABLE, ETHICAL AND FASHIONABLE COLLECTION FOR AN ECO-CONSCIOUS MAN. The collection also aims to promote longevity in fashion - a concept that seems to be disappearing in current Western culture. 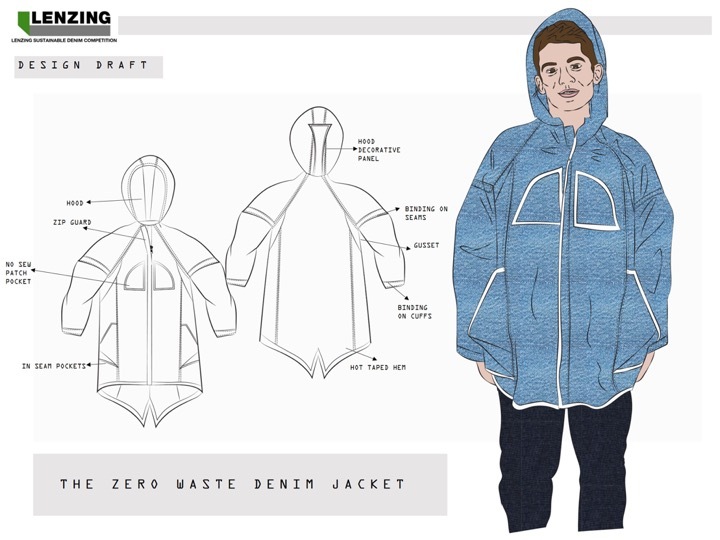 Designs are functional and adaptable - jackets with removable sleeves, trousers that transform into shortsoverallsthat can be worn as separate garments." "My collection is inspired by migration, travel and workwear. I've taken my shape and silhouette from a range of utility garments. I combined this with print, metallics PVC and denim to create the aesthetic for my collection"
"The outfit has come from my Capsule collection which was created out of upcycled denim, which was in past inspired by my own personal journey throughout life up until the age of 16." "I have always appreciated things with history and stories, the sentimental value in objects is something I have taken seriously from a very young age which helped me gain respect for all things"
"According to the Washington Post, the fashion industry is the second most polluting industry in the world, right after the petrochemical industry. Zero-waste pattern cutting embodies the idea of eliminating the average 15% fabric wastage through creative pattern cutting methods. My inspiration came from the idea of living a zero waste life, coming back to the natural element and leading a life that doesn't hurt nature"
All students used TENCEL™ or/and TENCEL x REFIBRA™ blended with recycled cotton or/and cotton from sustainable sources – great blended fabrics produced in Turkey (ORTA), Italy (Candiani) and China (Advance Denim). This breakthrough fibre combines quality cotton that would have gone to waste with sustainable wood pulp. It’s more efficient, more resourceful and a more innovative way to create fashion. An important part of the philosophy at Tencel, is visibility. Below, you can find both the lifecycle of the fibres, alongside the beneficial properties. Wondering how Tencel are able to ensure a responsible process? Find out more about the lifecycle of TENCEL™ x REFIBRA™ fibres can be found below. Means being resourceful in taking raw material which are already existing and supporting the circularity – making sure it does go back into our textile chain system. Sell the fibre branded as TENCEL™ x REFIBRA™ to spinners who blend it with recycled cotton or other fibres. Our fibre can be traceable, means gives 100% visibility to end user, transparency. There are many benefits of using TENCEL™ , including the properties of the material itself and the closed loop process. FIND OUT MORE BELOW. First and foremost, it's a feel good fibre! Want to know more about how the sustainable and responsible fibres function? Find out more here.